By Stephen Brett in Educational visits, News on January 17, 2019 . We were delighted to welcome Michael Collins, Ireland’s Ambassador to Germany, to Lucan Community College last week as part of the new national global schools initiative. Lucan Community College was one of only 20 schools across the country selected to be part of this new national educational programme. The Irish Ambassador was accompanied by Maeve Killen from the Department of Foreign Affairs, who opened the talk by explaining the context of “Global Ireland” programme and its ambition to double Ireland’s impact in the world by 2025. Ambassador Collins then took to the stage to outline the work of Embassies and the plans to broaden Ireland’s Embassy footprint through ‘Global Ireland’. He also spoke passionately about the importance of the UN, why we are members, and draw on their own experience with the UN and how the UN touches all our lives. This was followed by Irish peacekeeper who outlined Ireland’s work over the last 60 years as peacekeepers and spoke about the importance of peace-keeping as one of the main contributions Ireland will continue to make as part of ‘Global Ireland’. 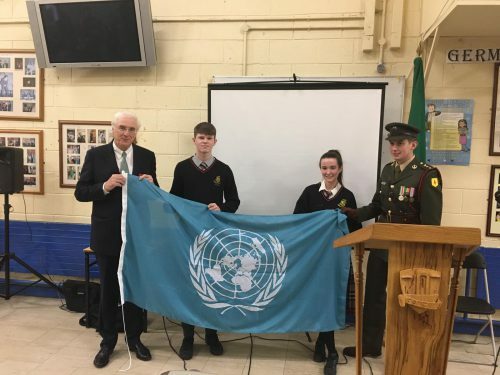 ‘Global Schools’ has allowed us a school to explore Ireland’s role on the world stage, bringing a deeper understanding of how UN membership and the Irish diplomatic service. The informative talk was attended by interested TY, 5th and 6th year students as well as our 5th year politics class and a group representing Amnesty. 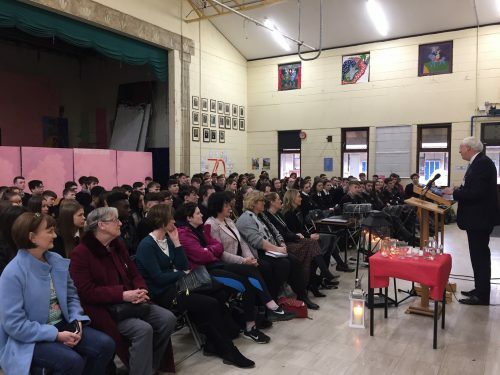 German students involved in our 25th exchange also attended having previously met Michael Collins as part of our 25th anniversary celebrations in Muenchberg two years ago alongside our college prefects and representation from our student council and active parents association.